Just one glance at the crowded streets of Jakarta will show visitors how problematic getting around in Indonesia’s capital can be in the best of conditions. Add rain, road repair and the ongoing Mass Rapid Transit project construction, and the morning and evening rush-hours into the mix, and the situation spirals into the overwhelming even for locals with their own vehicles. The buses in Jakarta are generally over-crowded and unreliable, so many people prefer to travel by taxis (Blue Bird and Express are the most reliable). 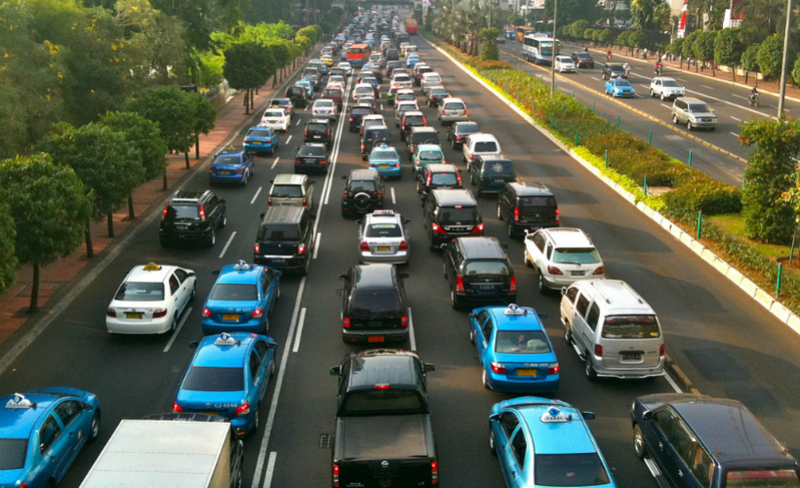 However the metered journey times can be very long and expensive in Jakarta’s notorious gridlock. Ride-share apps such as Uber, and Grab Taxi, have emerged as viable alternatives to taxis while Gojek and Grab offer motorcycle taxis for anyone brave or desperate enough to venture into the traffic chaos with nothing more than a helmet for protection. The vast majority of the capital’s populace depend on a motley array of Bajaj mini-taxis (short distances); ojek motorcycle taxis (short distances), and buses; transit vans; and mini-vans (long distances); or at the very best, the Transjakarta bus system. Of these options, the Transjakarta buses would be the most convenient and safe for foreign visitors to use. Soekarno Hatta International Airport has three terminals and a number of sub-terminals, which are basically passage corridors. Terminal 1 (A-B-C): Used by Express Air, Lion Air, Sriwijaya Air, Airfast Indonesia, Aviastar, Citilink, Kal Star Aviation, and Trigana Air Service. Terminal 2: Used by All Nippon Airways, Asiana Airlines, Business Air, Cathay Pacific, Emirates, Flynas, Garuda Indonesia, Japan Airlines, ValuAir, Kuwait Airways, Lion Air, Lufthansa, Malaysia Airlines, Malindo Air, Mihin Lanka, Merpati Nusantara, Philippine Airlines, Qantas, Qatar Airways, Royal Brunei Airlines, Singapore Airlines, Thai Airways International, Thai Lion Air, Tiger Air, Turkish Airlines, Xiamen Airlines, Yemenia, Air China, Air France, Cebu Pacific Airlines, China Airlines, China Southern Airlines, Etihad Airways, EVA Air, Garuda Indonesia, KLM-Air France, Korean Air, Saudia, and Vietnam Airlines. 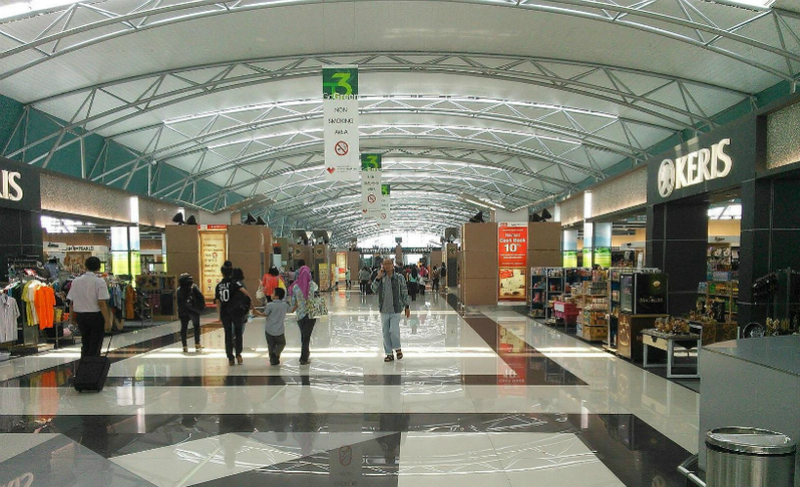 Terminal 3: Used by Air Asia Malaysia, Air Asia Indonesia, Batik Air, and Lion Air. People travelling into and out of Jakarta also have access to shuttle bus services from and to the Soekarno-Hatta International Airport. A free shuttle bus, which offers no external storage, runs between the terminals. Just ask the airport staff where it stops. It is advisable to avoid any contact or involvement with baggage porters as they are known for asking much more than the standard Rp. 20,000 from foreign passengers. The easiest and safest option for getting into the city is to take advantage of the free airport transfers that most hotels in Jakarta provide. Avoid the taxi touts hanging around near the terminal exits and taxi counters. They have a bad reputation for scamming unwary visitors by arranging rides for a flat rate that is much higher than the metered fare charged by reputable taxi companies. The most convenient way into the city center from the airport, albeit pricey, is to use the luxury (limousine) services or the Silver Bird premium taxi service featuring plush Mercedes cabs. The fees for this type of transportation are well above regular taxi fares. This service can be procured at counters just outside the customs area and at top-class hotels. 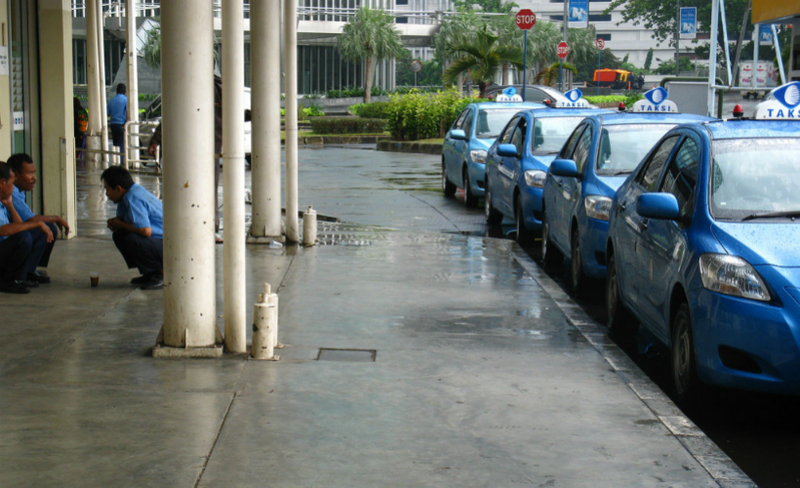 A number of reliable taxi operators, such as Blue Bird and Express, have queuing spots in the vicinity of the airport arrival terminals. Cars generally arrive within intervals of 15 minutes. Both have mobile reservation apps that can be downloaded here: Blue Bird / Express. Other reliable but smaller taxi fleets are Taxiku, Gamya, Dian Taksi, Putra and TransCab. Damri shuttle buses (15 to 40 minutes between buses, depending on route and time) offer rides to numerous Jakarta destinations. This reliable, comfortable, air-conditioned bus service from the airport has ticket counters just outside the Terminal 2 and Terminal 3 exits. Fares and schedules for all Damri Routes can be found here. Damri buses operate from 3AM from the city (various terminals in Central Jakarta), and up till midnight from the airport. The fare for trips from the Soekarno-Hatta Airport to the Gambir Train Station in Central Jakarta is IDR40,000. From the airport, buses stop to pick up passengers at departure areas in all terminals. Travel time to and from Central Jakarta is around 70 minutes, depending on traffic. All taxi fleets in Jakarta charge the standard fare of IDR6,500 at flag fall, and IDR3,500 per kilometer. Any tolls will have to be paid in addition and the driver will ask for money at the first booth. A word of caution when travelling by taxi – always have IDR2,000, IDR5,000 or IDR10,000 notes for tolls, and for paying the fare. The rule of thumb for paying fares without the hassle of haggling about tips is to round up the amount on the meter to the nearest IDR2,000 or IDR5,000 and pay that total. Otherwise, the driver will say he has no change and try to retain the balance, no matter how hefty. Please note that not all taxis on Jakarta’s roads are as reliable or safe as those of the fleets listed above. It is always wise to be vigilant when flagging down a taxi, but particularly so late at night; make sure you are getting a cab from one of the reputable taxi companies listed above. Also make the doors of the taxi you are in are locked and the windows closed, as luxury items or a bag can be an attractive target when stuck in a traffic jam or traffic light. Also available are Uber and Grab services, which are entirely app-based. Uber tends to be less costly than taxis except during peak usage periods. Both of these apps provide the perk of being able to charge fares to your credit card, which leaves it up to you whether you want to give a cash tip or not. Basic Uber X – Basic Fare: IDR3,000 + IDR2,001.44 per minute; IDR3000 per km. Grab Taxi’s rates are the same as for Bluebird and Express, with a minimum fare of IDR20,000. Cheaper and much faster motorcycle transportation (not anywhere near as safe or comfortable as automobile transport) is available throughout the city. 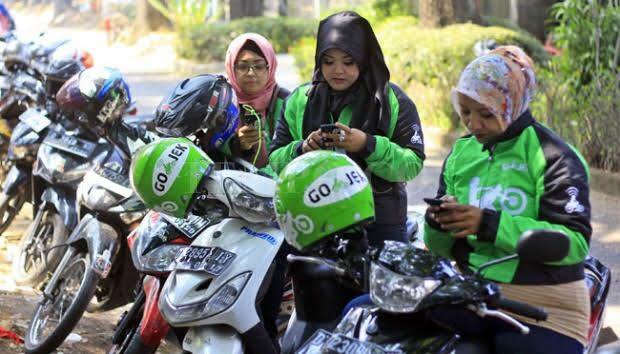 The original freelance motorbikes and drivers for hire, known as ojek, can still be seen at corners throughout the city, while the more organised Gojek or Go-ride and GrabBike or Grab can be reached through readily downloadable apps online. Gojek and GrabBike drivers where distinctive green helmets and jackets with the company names on them. 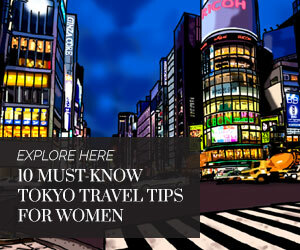 If the trip is more than 12 kilometers, the rate per kilometer becomes IDR2,500. KRL commuter trains connect the Jakarta city centre with the outlying regions of Tangerang, Bekasi, Depok, Bojonggede, Bogor and Serpong. It is also useful for travelling to distant points within Jakarta swiftly. The KRL is probably the fastest way to get around Jakarta. The commuter trains are cheap but overcrowded. 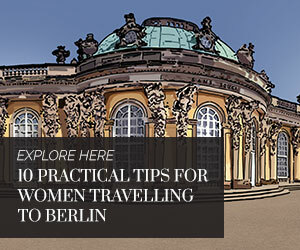 There are women-only coaches, which can be found at the very front and the end of the trains. 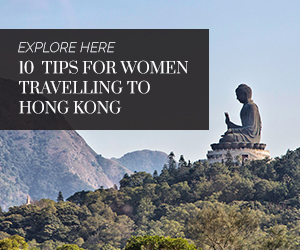 Women travellers are advised to use these especially designated cars. Current KRL fares are as follows: IDR3,000 for the first 25km, after which another IDR1,000 will be charged for each additional 10km. Details of KRL schedules and other information can be found here and here. Popularly known as Busway, TransJakarta consists of premium air-conditioned network buses. They ply an extensive system of routes along designated roadway corridors that can be safely accessed by pedestrian bridges connected to comfortable, covered bus stops. These buses are generally much more comfortable and available at fairly regular intervals than the older, poorly maintained buses and minivans that function as feeder vehicles for the Transjakarta system with irregular stops along the roadsides across the capital. As is typical of all bus services in the capital, Transjakarta buses, which run frequently from 5AM – 11PM daily, have no set timetables because of the anomalies of local traffic. The fares for Transjakarta buses vary according to the time of day. Since April 2016, the Transjakarta system has been providing 10 pink women-only buses plying the route from Blok M in South Jakarta to Kota in North Jakarta. The buses run roughly every 30 minutes, depending on traffic congestion. 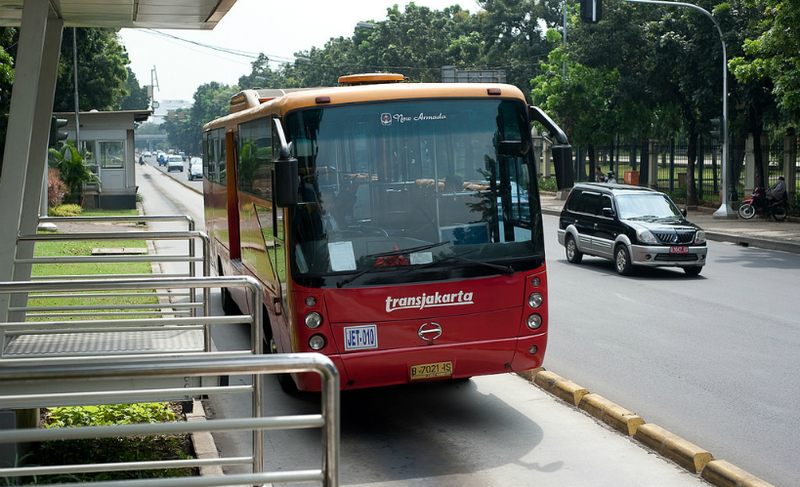 The APTB feeder buses use the Transjakarta busway routes within the city limits. Once the busway routes end, the APTB buses travel on regular roads to their destination terminals. The fare is IDR5,000 within the busway route, but can reach as high as IDR10,000 outside. More information on the Transjakarta Feeder Bus System can be found here and here.